Gunner came to AAE with two of his buddies in mid-January 2018 from a neglect situation. Fortunately, Gunner was in pretty good condition upon arrival. Gunner is about 19 years old, stands about 15.0 hands. He has some trust issues and we're slowly earning his trust. So far, we haven' identified any major issues. We've found some ticks on Gunner, too, but he's not infested like his buddies. Gunner, is a shy guy that appears to have been mis-handled at some point in life. He is halterable, curious, gentle, and willing....but sensitive and needs time to build trust and confidence. Per prior owner, he was started under saddle but not ridden consistently, and has not been ridden for some time (years). We'll continue to build trust and confidence with Gunner while he is with AAE, continue groundwork, and when ready, reintroduce him to a saddle. 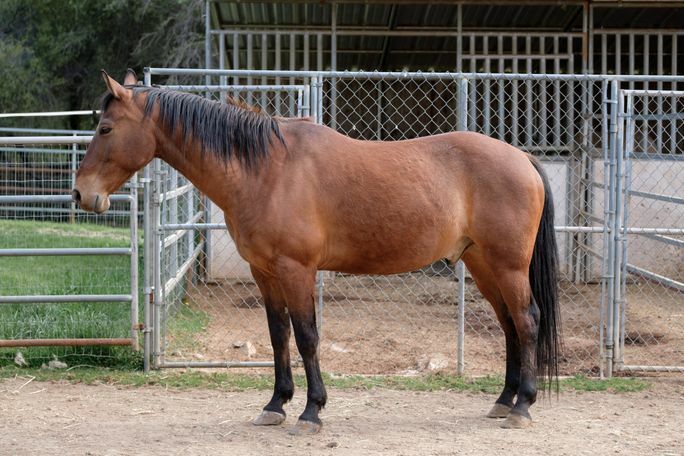 He will be looking for a home with experience with horses with trust issues; and someone willing to give him the time he needs to trust and flourish before asking more of him than he can comfortably give. So far, Gunner tends to be evasive for haltering, is fairly good leading, but needs more confidence; he seems to feel vulnerable with leg and hoof handling; and he is quite connected to Amigo. That being said, he's made regular progress, and he's becoming more willing to interact with humans. Gunner is a handsome guy, and we're looking forward to breaking through the surface of this guy and earning his trust. He is up to date with vaccines, deworming, hoof and dental care.